Off season in Burgundy, frosty nights and luminous days, are reasons alone to visit such medieval sites as Vézelay. But arriving “cold” on a recent winter Saturday, just before the tourist office closed, posed problems of lodging and a little nourishment. The few hotels open at this time of year were full or closed for the weekend. Luckily, after the cheery tourist office manager made two calls to chambres d’hôtes (B&Bs), a vacant room was found. We continued an uphill walk along the steep main street of Vézelay to a twelfth century hostel-hospital for pilgrims, now renovated into four bedrooms and a very large, vaulted central room which serves as a café-gallery. Once inside the gate and small entry court of “Cabalus, une maison d’un autre temps “, we entered another time zone: ring a small bronze bell, as a pilgrim would in the thirteenth century, ascend worn stone steps and walk through a narrow passageway, to enter a large bedroom. Look out the single window over tiled rooftops to Burgundy’s Morvan hills, look down at old (but spotless) floor tiles and around at white-washed walls. Sink into the bed’s snowy white down coverlet and imagine who has spent time in this room - pilgrims or travelers - over the last nine hundred years. It gives one pause. Dark wooden beams and white walls: simplicity prevails in the heated bedroom and bath. The shower and a sink with sleek faucets set above a wooden table are clearly not medieval, but contemporary and functional. After a walk through narrow streets and up to the Basilique de la Madeleine - do not miss the west façade’s tympanum at sunset - return for a supper of long-simmered soup and salad, the wise choice for a winter evening when most guide-book choices are closed. But, more important, be up for petit-déjeuner. On Sunday morning we took our places at one of the marble tables set for breakfast. Each setting was a still life: a single apple, a tray of jam and ruffly shaved cheese, a basket of homemade bread - warm from the oven - and a tall taper in a brass candlestick to light the marble table. Perfection. And while sipping coffee or tea, we admired the twelfth century vaulted ceiling, the fire burning in a broad fireplace, herbs hung to dry, and books of all sorts tucked in between old objects. There are prints, drawings and calligraphy, jewelry displayed on branches, all against the natural tones of walls that have weathered time. If these old walls could speak, perhaps their best expression would be in the small polished stones subtly carved with labyrinth designs, pendants created by the artist who renovated this welcoming space. Whether for pilgrims or those of us just passing through, time at Cabalus nourishes the body as well as the soul. Reserve with Mme Cabalus, tel: 03 86 33 2066, rue St.Pierre, F89450 Vézelay. 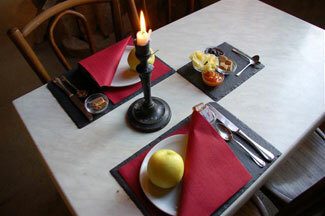 Out of season, B&B rates run about 80 Euros for a double room. Book well in advance during Easter or Christmas seasons.